Jeff G. Holt is the Editor-in-Chief and Brand Manager of the Bonnier Motorcycle Group’s Hot Bike and Street Chopper titles. Along with 12 other titles, they make up the world’s largest motorcycle media company known publicly as the Bonnier Motorcycle Group. Holt’s love for anything with two wheels started with racing BMX as a child in Southern California. His professional career started with sweeping the floors of a local bicycle shop at the age of 13. That turned into 25 years in the bicycle and action sports industries seeing the world from two wheels with roles ranging from product design and development, to race mechanic, to running his own marketing/public relations firm. His hobby was tinkering with old Harleys for fun until one day that became his day job. Holt is in charge of covering the real stories of customizing American-made V-Twin motorcycles through design and fabrication as well as the addition of aftermarket products to these cycles. 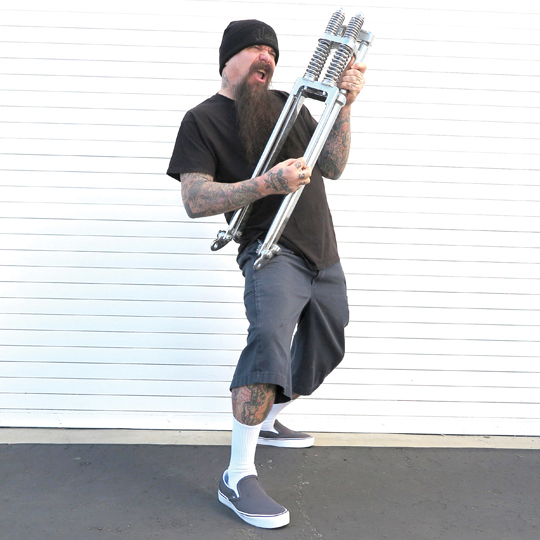 In his non-working hours when not hiking or riding BMX with his daughter Manni-Rose in Orange County, California, he constructs his own custom motorcycles, rides thousands of miles yearly, and truly lives and breathes the lifestyle Hot Bike and Street Chopper reflect.